Personalized Zippered Tote Bags Custom Printed in Bulk. Promotional, Very Inexpensive. Good Quality at the Bargain Prices for USA, Canada. 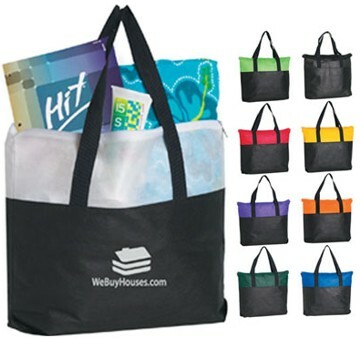 Bulk personalized zippered tote bags made of heavyweight, 110 gram, non-woven, coated, water resistant polypropylene. We also supply wholesale blank (not custom imprinted) zippered tote bags. Our wholesale zippered two-tone tote bags have large imprint areas on one or both sides. We have the Budget Prices in the USA and Canada for bulk personalized zippered totes. Free artwork design. American clients pay no taxes.